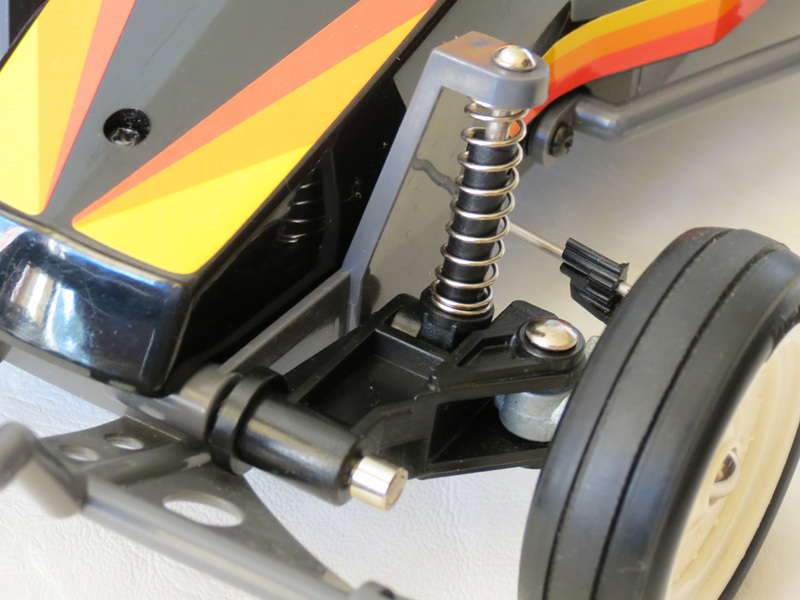 Perhaps the first toy R/C buggy to ever feature a transmitter lever with “Turbo” power? 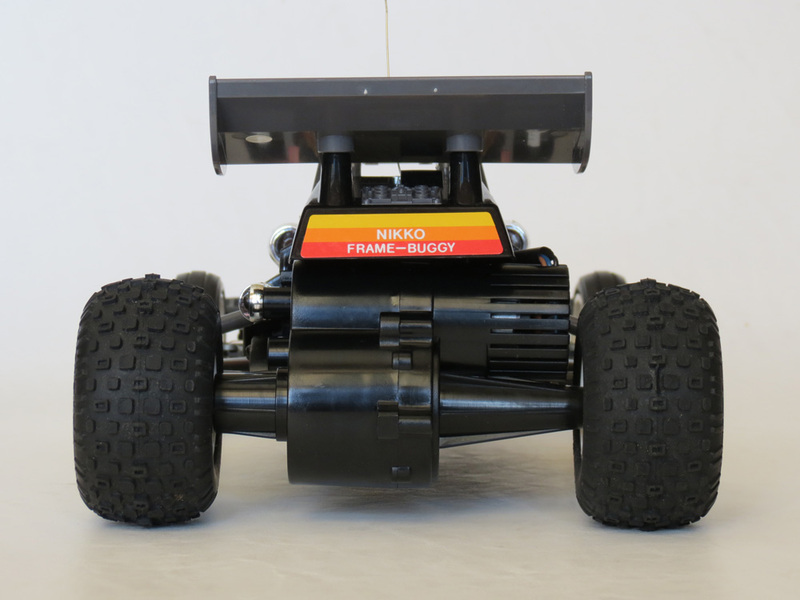 The Nikko Black Fox was a popular 2WD off-roader, and one of the first of it’s kind to mimic the larger, kit buggies in ready-to-run form. When I originally wrote about the Tyco Turbo Hopper a couple of years ago, I included the line “I can’t recall any other R/C vehicle using this gimmick [i.e. “Turbo”] prior to the Turbo Hopper.” – which was a true statement at the time. But I’ve now realized that despite popularizing the “Turbo” gimmick, Taiyo (the makers of the Turbo Hopper/Jet Hopper, and many other “turbo” marketed cars) were not the first to release a car with this feature – which captured the imaginations of swathes of kids back in the 1980s. 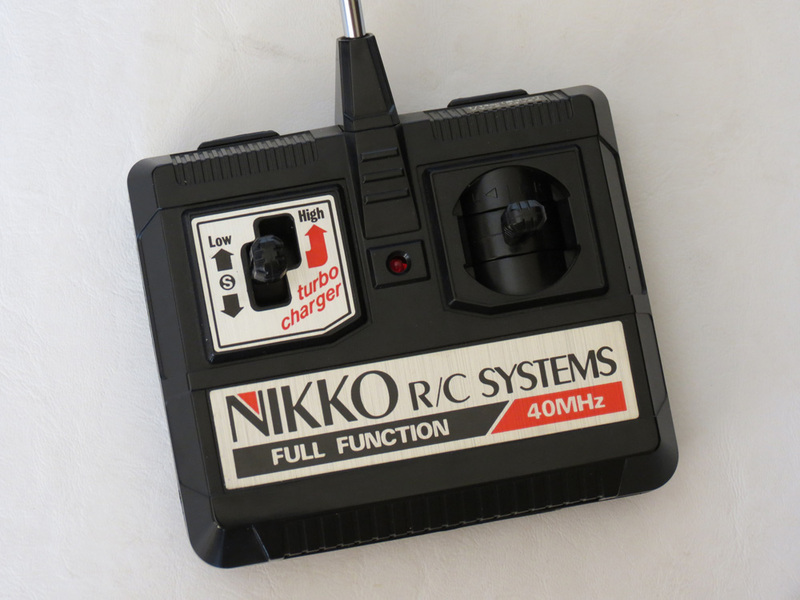 The Nikko Black Fox was released one year earlier than the Turbo Hopper/Jet Hopper, in 1985, and it has “turbo” too – basically a notch on the forward-reverse lever that allows you to run forward at two speeds (the higher being “turbo”). 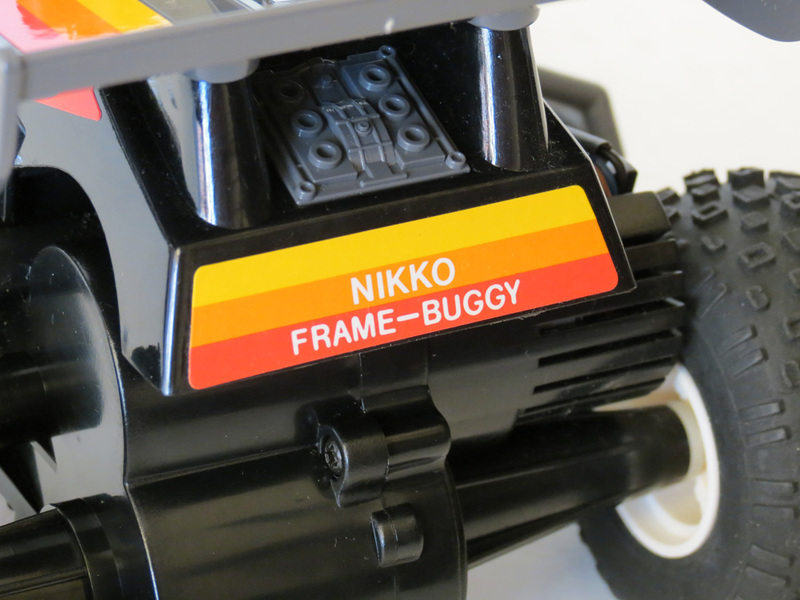 The Turbo Hopper/Jet Hopper may have ended up being the more famous toy, but it seems Nikko had already laid out the same basic template for success – with the Black Fox. 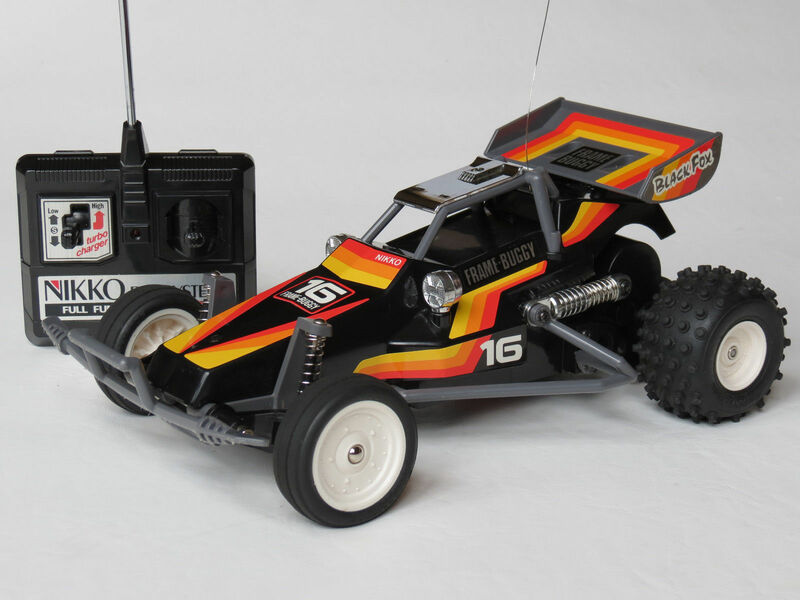 Not that Nikko wasn’t guilty of copying too – the Black Fox still owes a great debt to Tamiya. And quite frankly, just about everybody was copying everybody in some way or another! 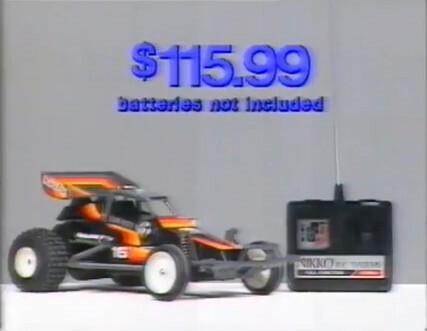 Nevertheless, let’s give credit where it’s due because the Black Fox was a great-looking, and quick little buggy that was a whole lot cheaper in the 80s than buying something like a Hornet (plus radio). And as a result, a lot of people owned them. 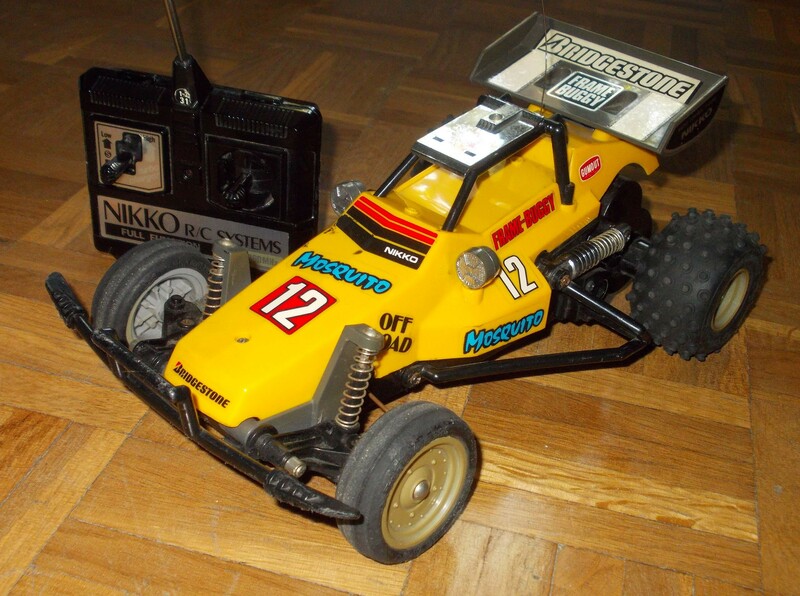 Fun fact: Nikko R/C cars were particularly popular in Italy back in the 1980s, where the toy company “GiG” distributed them. Just as the Jet Hopper had pinched ideas from Tamiya (including the word ‘Hopper’), the Black Fox appears to have taken influence from the Tamiya Hornet’s black + orange gradient colour-scheme. 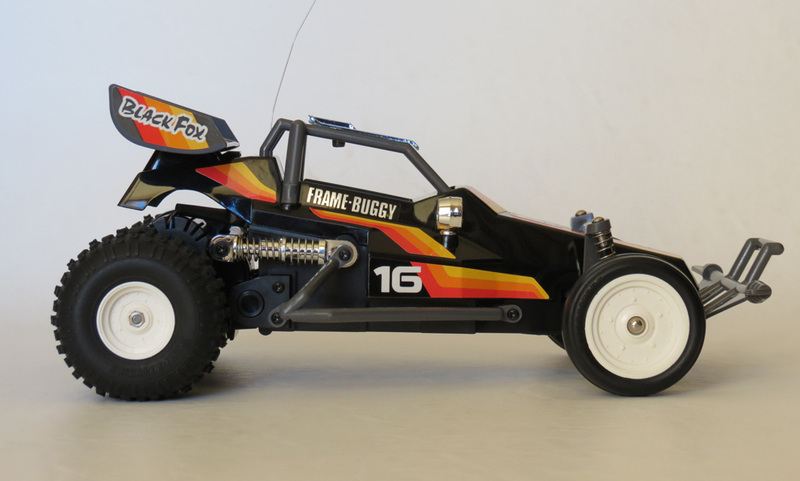 You might also assume that the “Fox” name was also copied from the Tamiya Fox, but it probably wasn’t…the Tamiya Fox was released in late 1985, so there’s actually a possibility that Nikko used the name first (or at least, before Tamiya, as there were other cars called ‘Fox’ before both of them!). 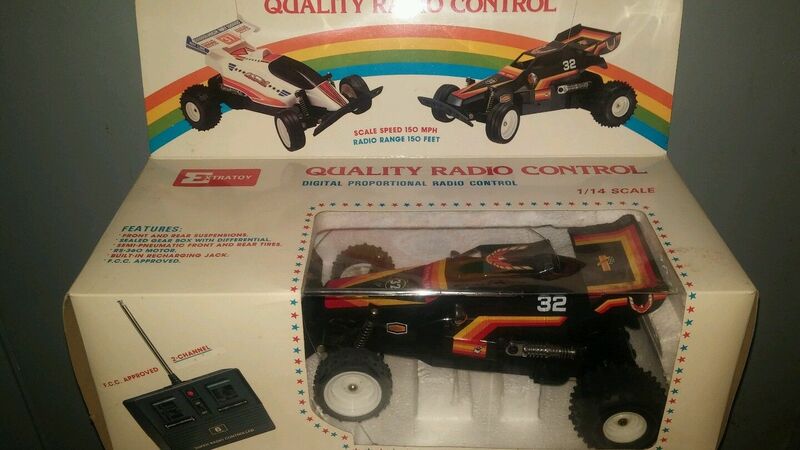 This really is one of the prettiest little toy R/C cars from the 1980s, that you will ever find – glossy, bright decals, cool logos, a great name, and lots of chrome accents like the roof, headlights and suspension dampers. At 1/14 scale, Nikko produced an extremely tidy and attractive buggy suited to those who found 1/10 scale simply too big, or who were too young to go building a whole kit-based car. 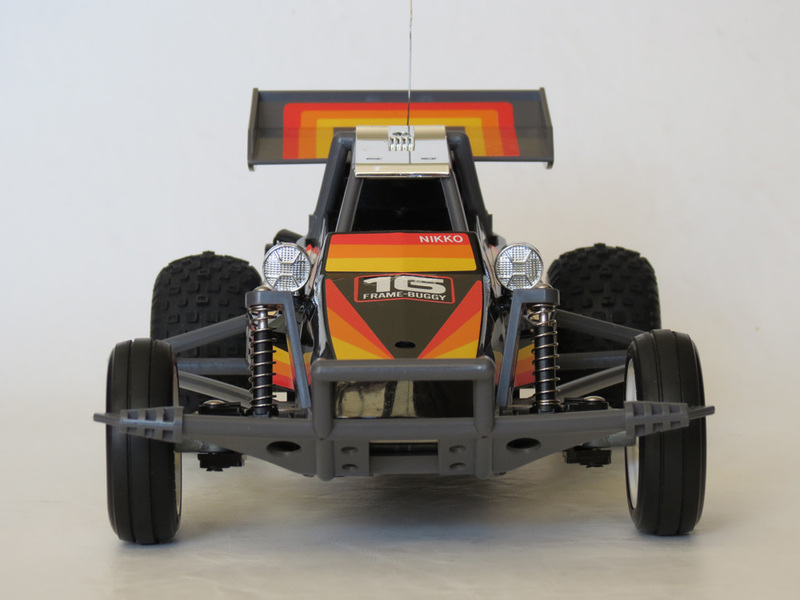 Being released in 1985, and being possibly Nikko’s first ever frame-buggy style buggy (that is – a buggy with a roll cage, rear wing and bumper, as opposed to a VW-derived beach buggy), the Black Fox marks a transition point in Nikko history. Nikko hard started the 1980s by releasing beautifully realistic scale R/C models, a few of which I have profiled before such as the Unimog. 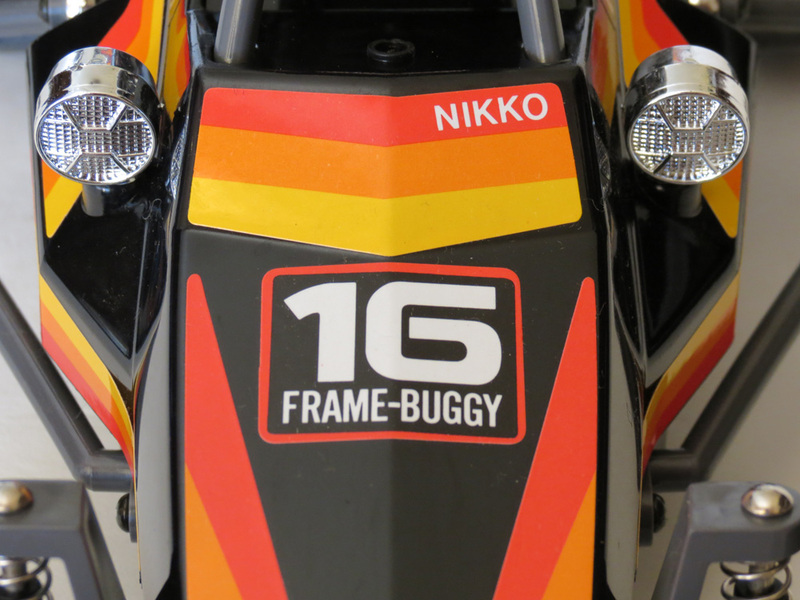 By the late 1980s, Nikko was practically releasing nothing but buggies – their lineup was about 90% buggies and 10% monster trucks. Mid-way through the decade, and you can see why they would release a model like the Black Fox, with it’s combination of exciting new buggy performance, and old-school realism. However, most Black Foxes actually have different tyres with a round-knobby pattern – check out the rear tyres on this Black Fox that I sold a while ago, to see what I mean. These can be considered the Black Fox Mk2. Meanwhile, here’s the front and rear profile of the Black Fox. Much like the Hornet, the car features a bulky, fully-sealed rear gearbox to power those fat rear tyres, along with a large protective front bumper and some side nerf-bars as well, for side protection. 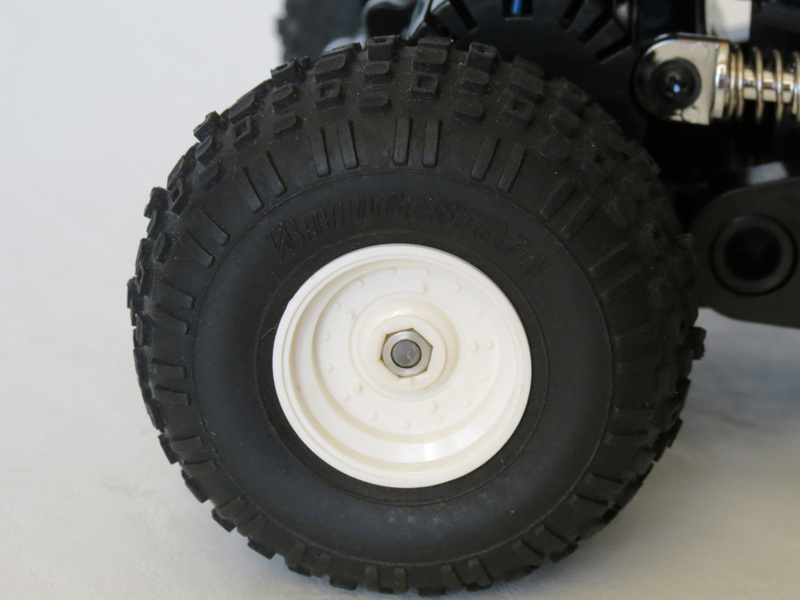 The front tyres are smooth with simple grooves to guide the car across sand. Like countless other buggies released over the years, the Black Fox features the same 2WD rear drive-train + rolling rigid rear axle suspension + independent front suspension setup. 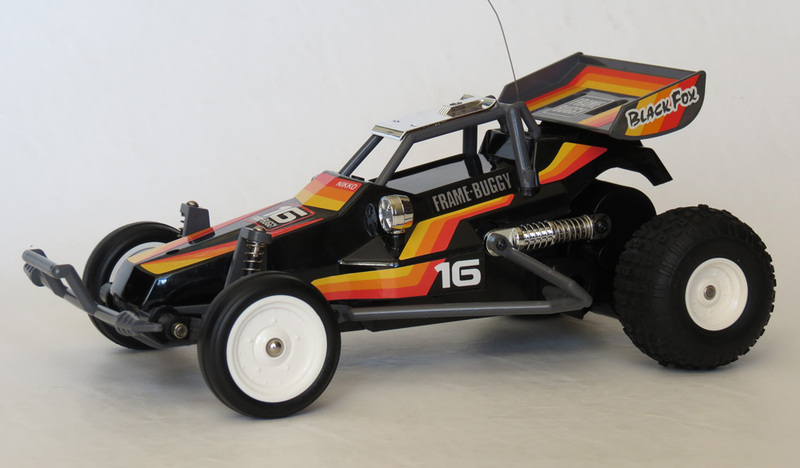 This versatile layout was first popularized by the Tamiya Grasshopper, and proved ideal for the kinds of smaller scale, basic buggies that Nikko wanted to produce as well. Suspension consists of simple springs that are pretty firm, causing a bit of bounce as the car runs. But at least they’re fully functional – it wasn’t unusual for some toy buggies to include springs and yet offer little to no suspension travel at all. 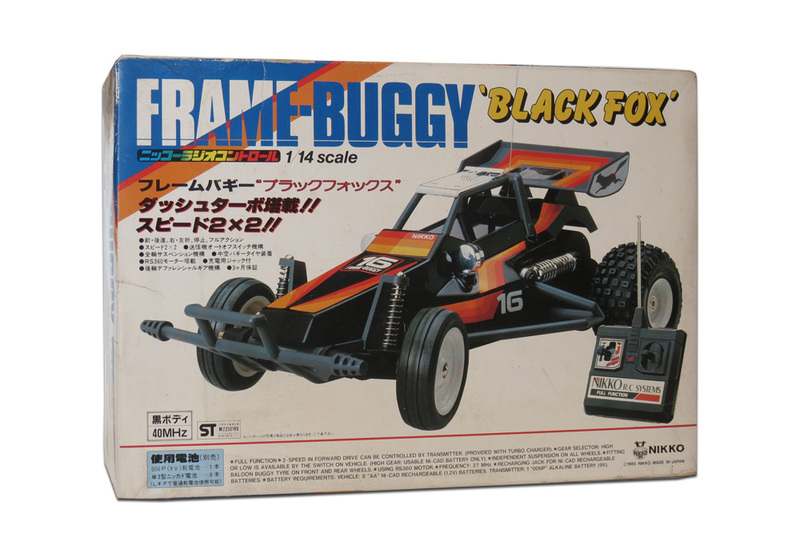 But then, the Black Fox was neither the cheapest, nor most expensive R/C buggy of it’s time – it was squarely in the middle. Which means you were paying a fair bit of money, and expecting a pretty decent toy in return. And much like the Jet Hopper, it had all the basics you needed for off-road fun – great tyres, working suspension, a couple of gears, and a decent sized motor with a bit of power. It was not as quick as a buggy powered by a 7.2v battery pack and a larger motor (such as most Tamiyas and their ilk, or any other 540-motor-powered car like the Golden Arrow). But it was just about the next best thing. Needless to say, this made the Black Fox a very popular choice. And the basic chassis was later reworked, renamed and re-coloured for a number of different markets, as the buggy craze of the mid-1980s meant that just about every decent toy store needed to offer some mid-range, reasonably affordable, off-road R/C cars, to satisfy demand. Over in the USA, a release of the Black Fox was called the “Lobo” (which means “Wolf”) and was sold by the Sears department store – i.e it was the Sears Lobo. Here’s one I sold a while ago. And last but not least, here’s the evergreen Nikko “Turbo Charger” transmitter, with the nifty gear-shift style acceleration lever that I absolutely loved on my own Nikko Night Stalker when I was a kid. 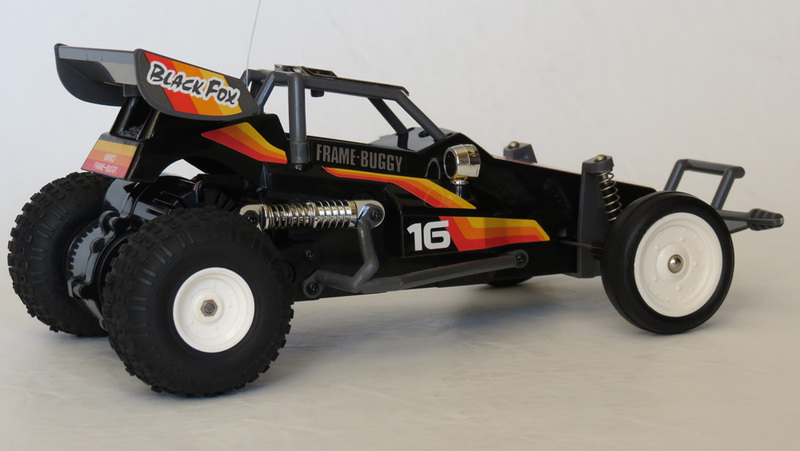 The Black Fox is a classic mid-range buggy that has the looks of a Tamiya, but in a smaller package. 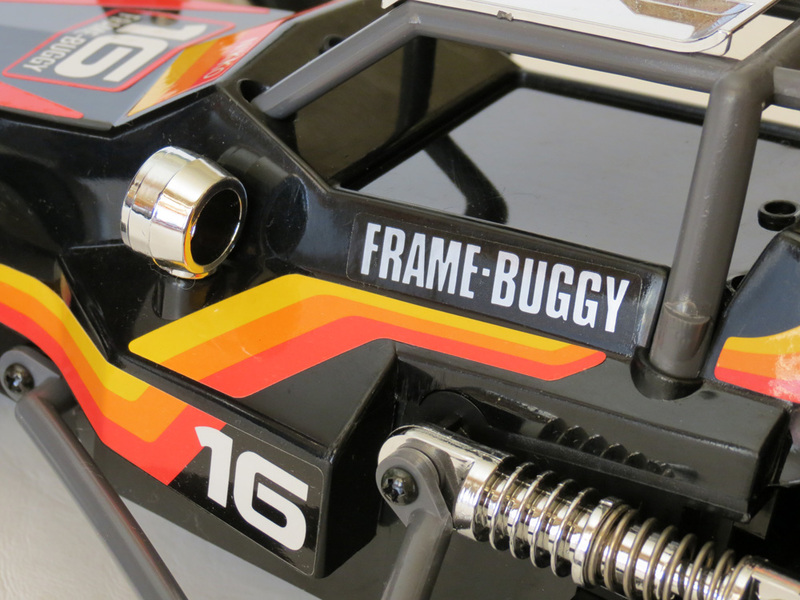 But it’s also historically significant as one of the first toy grade frame-buggies – prior to this, most of the off-road toy options available tended to be more basic, have little or no suspension, and looked more like what you might consider a ‘beach buggy‘. These days, Black Foxes are quite collectible and prices generally fetch between $100-$200 for examples in excellent condition. But if you see a brand new one, don’t miss the chance to buy it (as always, brand new examples are by far the hardest to find). 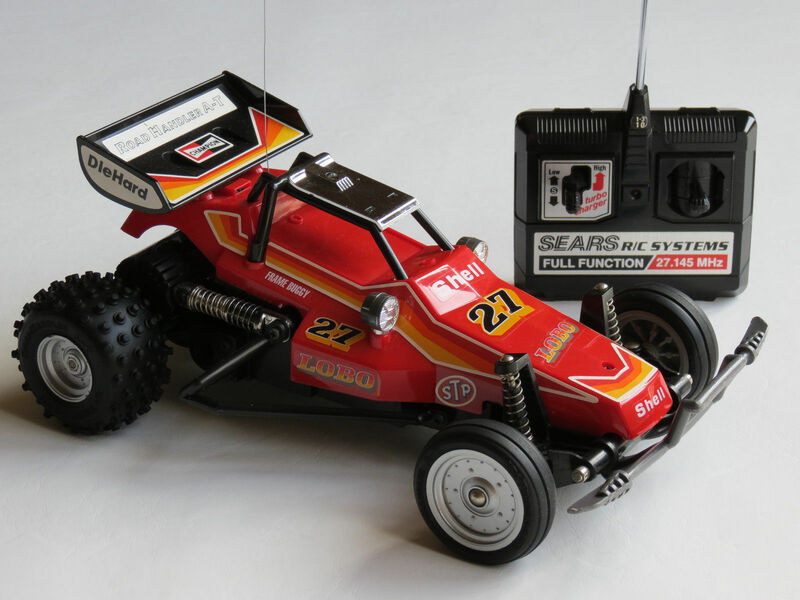 Was Black Fox really the first RC toy car to have the “Turbo” feature on the speed lever? I had this car back in 1987 and prior to that, I had the Nikko Porsche 956 which was the first RC car ive seen featuring the aforementioned “Turbo” feature. But whether the Porshe or Black Fox came first I really don’t know. Hey Jacob – I’m open to new info on the turbo issue 🙂 But so far (and since it hails from 1985) the Black Fox is the first one I’m aware of that had the turbo. Of course, working out the year of release of some cars can be tricky, but most Nikkos have the year printed somewhere (either molded on the underside or on the box). Your Nikko Porsche 956 might be from 1986? Maybe you can check. The Porsche could very well be from ’86; I got mine for xmas in ’86 and I remember I saw it in a supermarket where they got it a few weeks earlier. The year after I got the Black Fox (first ed. – same as in your photos above). I don’t recall when they released the second ed. with the more spiky rear tires? I found a Porsche 956 on ebay, but the photo of the underside of the car is too poor quality to make out any year, so I wrote and asked him if he could check. For a minute I thought I had got the clue that would answer the question to which one was first, as I saw the Porsche had auto-off swith on the transmitter, but it appears that Black Fox had that as well. Thanks for that Rully, I’ll have to add this to the list of other releases of the Black Fox.